I have being looking for way to change up my exercise routine, so I enrolled in a cardio kickboxing class; this class is three days a week for month. This week was my second week and I'm loving it. At the end of day three with a very sore body I thought about the benefits of cardio kickboxing. I have taken several cardio kickboxing classes but those classes are glorified aerobics classes in comparison. This training is a precursor to contact kickboxing, which I may never do because I don't plan on standing around fighting the bad guy, bu one never knows. I am learning self defense moves while strengthening and toning my body. So far I found five benefits (1) it helps to release stress and tension, (2) it has increased my energy level, (3) it will tone and shape my body, (4) it is a full body workout, (5) it incorporates cardio with strength training. The kicking and punching helps to get out all the pent up aggression. There are times when I close my eyes and imagine the person who pisses me off the most bloodied and lying on the floor moaning in pain. Yep, I have a little anger management issue. Even though my body feels as if it as gone through the ringer, I feel much more energized in the morning. It may be due to the comatose sleep I fall into after these sessions. Whatever the reason my energy level is up. 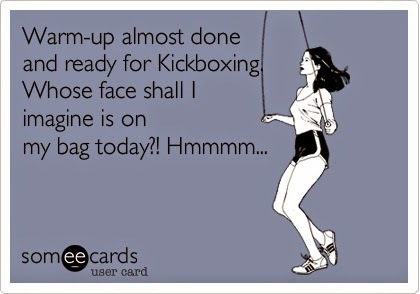 I am loving that kickboxing is a full body exercise, and even though I'm not doing contact kickboxing it does feel exhilarating. There are moments when we are going through a circuit where realized that my cardio strength needs to improve. In a good kickboxing session you should be working, core, legs, arms, and back and have elements of both strength and cardio. In the past two weeks I felt like a superhero and even having thoughts that I could be the next wonder woman. Well anyway aside from my fantasy that I could be a kicking and punching crime fighter, i am loving kickboxing. I probable won't be able to defend myself with the moves i have learned but I feel great practicing them. I have two more weeks left of the program, so I might become a crime fighter, yet.